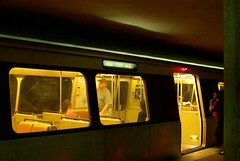 Metro is single-tracking around a fatal incident at the Forest Glen station this evening. The incident, which happened just after 4pm today, has resulted in the death of the individual who was struck by the 8-car Shady Grove-bound train. On top of the other delays (which WMATA advises may add 30 minutes to your transit time) this will add significant time to your Red Line commute this evening. No word on details of the incident yet, but we’ll update this story as we hear more. Update 1 5:10pm Metro spokeswoman Angela Gates is now saying that the person who was struck was on the tracks deliberately. Metro Transit Police is very interested in talking with anyone who saw the incident today, please call them at 202.962.1792. Red Line is the line of doom.